During one of the discussions a point was raised – what is rebirth? Is it a truth of life or pure figment of imagination? Is it a pure hypothesis to explain some unexplained phenomena related to fate? Is it just to satisfy the people who are poor so that they do not rebel? Is it propounded to direct the mankind on the path of virtue and create an orderly peaceful progressive society? Is it to befool people who are oppressed to work harder and harder? Well so many questions arise. Most of the time negative gets more prominence over positive. So rational thinking is abandoned. At first instance, it is to be clarified that Hindu religion makes fine distinction between Reincarnation and Rebirth. Reincarnation is generally referred to as God coming to Earth in human form to give message and do correction in the society which deviates from path of truth. Rebirth is different – it refers to continuous journey of soul of a man – entering in flesh again and again. I shall delve upon it in greater detail. But rebirth cannot be interchangeably used with reincarnation as per Hindu Philosophy. Abrahamic Religions – Judaism, Christianity, and Islam do not believe in theory of rebirth but some groups within these religions do refer to rebirth/reincarnation. The principal point of the doctrine is that the soul does not die and that after death it passes from one body to another – the main object of this education is, in their opinion to imbue their scholars with a firm belief in the in-destructivity of the human soul – which robs death of all its terror – can the highest form of human courage be developed. Birth is not the beginning, death is not the end. There is existence without limitation; there is continuity without starting point. Existence without limitation is space. Continuity without a starting point is Time. There is birth, there is death, there is issuing forth, there is entering in. According to Plato number of souls must be finite because souls are indestructible. This concept of rebirth necessarily implies the continuity of personality – that one is able at least potentially to remember that one has lived through previous existences and these existences were one’s own. In nutshell, so many around the World believe in philosophy of Rebirth but Hindu Religion has propounded the theory in great detail. In fact it is the backbone of the Hindu Philosophy. Like all religions, Hindu religion also establishes a God – Great Infinite Indestructible Source of Energy. He is Supreme and controls everything directly or indirectly. Something beyond our comprehension. Beyond time and all-pervading in space. As per science – There is a law of conservation of energy. So it applies to cosmos also. Total sum of cosmic energy has to be constant all the time. He wishes to play a game. No answer can be given why He is doing so. He creates Souls out of his part – pure, sublime. Soul starts journey in this universe with ultimate aim to reach Him and to again get immersed in Him. At this point one more quality of God may be enumerated – He is source of Supreme Ultimate Bliss – Paramananda (permanent bliss). It is desired of Soul to get to ultimate bliss so as not to go into the pain of cycles of birth and death – Moksha (ultimate salvation). Soul enters into body. Soul being part of God is real – (indestructible) whereas body which it acquires is unreal – destructible. Soul somehow gets distracted and starts thinking body as its own. It is supposed to have its own clear identity. Swami Vivekananda says Hindu admits that he does not know why pure soul (real) starts thinking body (unreal) as its own. Body consists of five indriyas, five jnanendriyas, mind and intelligence. Here the game begins. Intelligence is supposed to control indriyas, jnanendriyas and mind so as to put Soul on the right path – to reach God – ultimate bliss-moksha. Now Theory of Karma needs to be explained. Soul (as per Hindu philosophy it can be called as Atman which emanates from Paramatman – God) manifests in this Universe in flesh—body from time to time – birth. In which place? In which form? — all depends upon theory of Karma . If we say in nutshell, Theory of Karma says – you reap what you sow. There is a bank account (fate). Good and bad acts (karma) accordingly create credit and debit on continuous basis for the account holder Soul. Good credit history ensures that Soul gets healthy body and good place to live. Ultimately if Soul gets on collecting good credit points – scores enough brownie points – it qualifies to merge with God – the ultimate residence – ultimate bliss – happy ending to journey . If soul fritters away its credit and goes into bad debts by doing bad Karmas, its credit history becomes bad. Soul deviates from its path (poor use of Intelligence to control mind and indriyas and jnanendriyas) and it has to suffer. Soul may have to go to Bhog yoni or Karma yoni. Do not know who decides? Some auto subtle mechanism? Do not think that God has time to take care of micro-details . Bhog yoni means other than human form – some creature. In this Bhog yoni there is no intelligence. It is only punishment period. Let us say heavy debt and bad loans so soul is put in jail for specific period. In Karma yoni, soul manifests in human form. He is given intelligence to redeem Himself. He is again given opportunity to create good credit history towards his ultimate goal. So as per Hindu Philosophy, it is very fortunate that one is born as Human because it is only yoni which allows to improve and go for Salvation – moksha –ultimate bliss and permanent happiness – the final goal . So it is all mixed bag of actuals, imaginary, deep rooted thinking, and conjectures. But our rishis and munis have a final word. They went into deep meditation and fathom deep into the deep sea of intelligence and mind and they have come out with the truth. It is question of faith and belief only. However, Hindu religion gives a wide rope and you can question everything; but underlying principal is let us work for the good of the Mankind. Work is worship. Up until now the soul has been treated as a unit. I am simply questioning that. Where is this idea coming from that soul must be an indivisible unit? Is soul an indivisible unit, or can it disintegrate into small parts? I would say it is more likely that the soul, which I will redefine as a non-dimensional awareness (NA) can make a whole or partial copy of itself (divisible in this sense), but would not disintegrate of its own, or natural, accord. The NA can give rise to (create knowingly or unknowingly) dimension, known as space or energy. Spaces and energies may be continuous, or bounded; interactive (with other spaces or energies), or non-interactive. All of these conditions could arise from a singular NA. The physical analog of these properties is the Higgs field (seemingly non-dimensional) which will beget the Higgs boson (dimensional) which will divide into smaller units, including un-divisible elementary particles (dimensional). I would argue that the NA, or a multiple of co-working NA’s could create a Higgs-like field and thus beget a universe. If you want to re-phrase that into a manner that approximates the common view of creation you would say that God(s) [NA(s)] created the universe and that the souls inhabiting the universe were created by God(s) (partial copies). Unfortunately, re-phrasing to the common view re-enters all the fallacies of the common views (Omni-presence, Omnipotence, Omniscience). The reality could be much, much simpler. I believe that cause-effect, consciousness (awareness), will (self-determinsm) etc. are various dimensions of life in its abstraction. Space, in its abstract form, is probably a matrix made up of these dimensions. My humble opinion is that there cannot be any non-dimensional awareness that creates space, because awareness itself is part of space being a dimension of life. This is what mindfulness of abstraction brings to view. Nothing non-dimensional can ever exist because existence itself is an abstraction of matter, energy, space, time and consideration. It is not without dimensions. Non-dimensional point of awareness existing is a conjecture that is self contradictory. The problem with all these conjectures of soul, thetan, ectoplasm, etc., seems to be that the dimension of abstraction is not properly understood. The one thing you have to look at and understand, to a degree, is the quantum concept of the un-condensed, probabilistic state. This state does not imply any dimension as dimension is a product of wave/particle condensation. The state may be a form of superposition of all possible states. Pure non-dimensional probability explains it best. That probabilistic model is the basis for quantum mechanics that is now producing quantum computers and zero speed light (at 1m/sec, it’s practically zero speed, anyway). It’s pretty much a reality( 🙂 ) that we have to accept, even though it seems counterintuitive. You need to explain away this probabilistic state by more than calling it an abstraction. You also need to explain why awareness needs to be dimensional before you can say that a “Non-dimensional point of awareness existing is a conjecture that is self contradictory”. Why does awareness need to be “part” of space? 2ndxmr, I am simply looking mindfully at what is there without assuming anything as best as I can. The idea of quantum is that things jump from one stable state to another stable state and not move gradiently from one point to another. What you are calling “uncondensed probablistic” is simply one of those stable states where something is found. Why does such a state not imply any dimension? Anything that one can be aware of has a dimension. No dimension would mean no awareness at all; and that would mean that it doesn’t exist. It, therefore, doesn’t need to part of any computation. Mathematics must be consistent with reality, otherwise, it is simply a representation of some assumption and should be done away with. That is what I feel about the string theory. That theory involves too many assumptions that cannot be established as consistent with reality. Being a wave or being a particle are two points of a dimension. A dimension is any scale of awareness of particular type. The tone scale is a dimension. Temprature scale is a dimension. Good-evil scale is a dimension. Not all dimensions are as fundmental as space-time. There are dimensions that derived from other dimensions. For example the dimension of speed is derived from distance and time. It is dimension that is plotted on x- or y-axis of a graph. I believe that the concept of dimension has been very much misunderstood. It cannot imply dimension because it is a superposition of states. You have to understand the principal of superposition. If you took two holograms of two different houses, you could project them into the same space and see them superposed, one on the other. You couldn’t take two physical houses and do that. The quantum probabilistic state is very much like the overlain holograms. Any number of holograms could be projected into the same space. All would be equal until one was selected and condensed into a physical house – i.e. until the wave function collapsed, so to speak. In the quantum superposed state the various possible outcomes (stable states, and possibly even unstable states) exist as a sort of probabilistic hologram. From that set of “holographic images” (multiple sets of possible dimensions; the “wave function”) a collapse will beget a single set of dimensions that will be the particle, wave or whatever. Thought does not have dimension. You can mock up a line in the space in front of you; you can twist it, enlarge it or disintegrate it. None of those actions will change the space in front of you. Thoughts, pictures and mockups will not have dimension unless they are condensed to energy (which can happen with either unpleasant thoughts or pleasant thoughts, condensing to form energies that react on the body). (1) Dimension is related to space. There is abstraction of space taking place in the KHTK Model of The Universe. So there is abstraction of dimensions also. (2) Thought does not exist in physical space. It exists in mental space. It has dimensions in mental space that are abstract in nature. (3) The word “dimension” has the root meaning of “to measure out”. Thus any aspect of exstence that can be measured either concretely or in some abstract fashion, will have dimension. (4) Probability means “likelihood.” This can be measured, so it has a dimension. It can be plotted on graph. (5) Any state, to be recognized as a state, must have a dimension because there are many different states. Death and birth are two concrete event that lead to the sense of religion. These two events take us into deep thinking, or to extreme depth of abstraction. God is the deepest of those abstract realities that humans have tried to grapple with. What happens after death up to the point of birth is the deepest of mysteries. 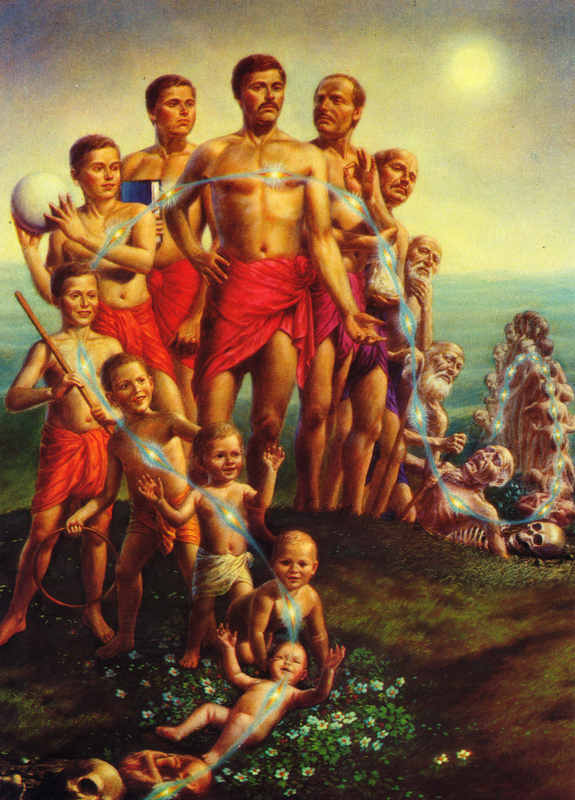 Rebirth has been one of the ancient ideas to fill the gap of knowledge from death to birth. The other side of this mystery is what happens from birth to death. This is called life. Life is self-evident but not less mysterious. We draw knowledge from this period of existence (life) to project what happens in the period of non-existence (after death). This is the realm of religion (beliefs). But it is also the realm of rational conjectures (philosophy). “Krishna exhorts Arjuna to put attention on what is truly real and relevent and ignore all else. Sense objects, such as bodies, are perishable. The feelings from them are transitory and fleeting. These things are not relevant. On the other hand, the essence that pervades these sense objects never ceases to be. It is neither the cause nor effect of these sense objects. It is neither born nor can it be destroyed. It is beyond the transitory manifestations. The question is, does this relevant essence, which we refer to as Atman or soul, represent a definite structure that is permanent, or is it an abstraction of an individual whose material form has ceased to exist. In my view, this abstraction is a unique combination of charactristics that reminds one of the individual. After the death of the individual, there is nothing to keep these characteristics bound together as before. These characteristics (such as memories) may still exist, but they may get distributed among various new souls that are coming together in new bodies. The relevant essence are these characteristics that are never destroyed, but the unique combination of them that existed during life, may not stay together as a unique unit after death. We simply assume that it does. An understanding of the dimension of abstraction puts the situation in a better perspective. I do very much enjoy 2X’s constructs and Vinaire’s colation. Each has been supported with a lot of research and underpinned by lifetimes of learning and practice. My current view is that to mentally force the underpinnings of this universe to conform to our human abstractions of “individuality” seems unnecessary. All about us are life sized examples of what is really occurring with regard to birth and death and rebirth. My own understanding of this is that at our level or call it the macro dimension of existence that things work just as they appear to work. Rebirth occurs, but it occurs more nearly according to a fractal iteration with birth and death of species occurring in an overlapping way. For me, this is the pan-determined look, is easier to reconcile, provides less of a buffer because the buffer of individual continuity is not necessary. I think of the lot of us as leaves on the tree. The seasons come and go as do the leaves but the tree remains. And I don’t posit this with any particular attitude except for a relaxed and open view to life and whatever that may show me. Colation = The act or process of straining or filtering. hehe another metaphor and a bit of tautology for looking. I think of your sorting and organizing as well, but that is collate. It is good to “filter out” assumptions, so the reality may be perceived as it is. If the OP picture at the top of the page could show the line of birth, aging, death and rebirth as it does and then to show more of these lines parallel to one another, and then to show them staggered as the various stages of life so that the same stages were not next to each other, then that would be a picture of what I am trying to describe by rebirth. “Un-condensed, probabilistic state” is a state that has not materialized yet but it has a certain likelihood of materialization. So all we have is no state but a computed probability. Probability can be plotted, so it has a dimension. As far as the state goes, it will have dimensions when it materializes. Until then it has dimensions only in terms of probability. If the stimuli has responses that have dimensions, then the superimposed respnse shall have the same dimensions. (1) All those theoretically possible states have the dimension of likelihood. It is an abstract dimension. (2) When observed and measured, one obtains the actual dimensions. (3) In no case there is absence of dimensions as you claim. Here one is using the two quantum states as 0 and 1. Logic circuits would have to be developed using these two quantum states instead of two different potentials of voltage. Vinaire and 2X: Reconcile probability with free will. Where there is probability, I understand there is determinism at work. Where free will, no probability? So when I say, “I will probably go to the dance,” am I saying that my arrival is not under my control but that I am careening toward the general direction of the dance at roughly the appointed address, date, and time so if I arrive it will be because circumstances dictated? A being is a function of properties like cause-effect, Will (self-determinsm) and consciousness (awareness). It is not entirely free. Existence is a matrix of cause-effect. Portions of this matrix may attain a concentration or density to precipitate as a being. There is the vector of cause-effect at each point of the existence matrix. In a being, such vectors may combine to form a dynamically varying resultant to make it appear that the being has a will. There could be a probability function applied to the will and consciousness, which may then form the core of the being. Yes, that is what I see. I think of the probability as all that determinism brings to bear on that condensation of focus, harmony, or what have you. That determinism might be like the compression spring within a wind up toy, and the individual like that toy. The consciousness is the experiencer and the experience. I only see that it is and I only see the inconsistency of how it doesn’t appear to be laid out quite rightly in human lore, ego and fixation on individuality. But I do see fixation, ego, and individuality as some sort of culmination of considerations wound up in a thicket of considerations. Not unlike others, falsely or incorrectly but at lease honestly, I have past life memories as simple and ordinary as any currently life memory. Does this mean that “I” have lived before this life? No, I do not make that leap or assumption. The sense of it is real as ordinary senses can allow but I don’t think the whole thing is quite so simple nor laid out correctly. Though, I do have to say that you are doing quite a good job of breaking things down. It is a lot of work. Memories are more of a reconstruction than a recall. If memories are more of a reconstruction than a recall then that would tend to falsify orthodox reincarnation. As I have written, rebirth occurs all around us just not serially as individual reincarnation points to. A better model is fractal. The soul continues from one birth to the next. It just happens to be not entirely the same soul. Come again? Are you stating a religious tenet? Or what? “Earth to earth, ashes to ashes, dust to dust” and soul to soul dust. New bodies comes from that earth, ashes or dust. New souls come from that soul dust. Basically, what I am saying is that the soul does not carry its identity forward after death, but merges into a common pool of soul dust. This is my conjecture. Fractal coordinates are recursive and self similar, is this what you mean? Yet if we were to think of soul-dust as being plugged back into the fractal equation in the sky, then that would add some consistency to what you wrote. The vector may put an enormous force against one in making such an off-vector choice, but it is still possible. That is the difference between an awareness, which can consciously change a condition, and an un-awareness which can only change as a consequence of external forces and conditions. 2X: ” ‘To hell with it, I’m gonna…!’. . . That is the difference between an awareness, which can consciously change a condition, and an un-awareness which can only change as a consequence of external forces and conditions. A priori basically seems to be a tautology. Vin: It is basically a tautology. Chris: You really are seeing what I mean by tautological universe? I joke about it, but I am not kidding. There is a ubiquitous quality in this that I feel needs to be noticed. The KHTK model of the Universe is spherical, which also implies that the universe is a tautology. One may say whatever one wants, but does it determine what one says and wants? Free will is not just the ability to say and want things but also to make those things happen. I do not think that such free will exists. Free will cannot be executed through force because there is always going to be some reaction that one did not intend. Free will that uses force cannot control all the reactions. Since being is a part of the overall matrix of existence, natural connections may exist among beings. Such natural connections may contribute to phenomena, such as, telepathy. But telepathy may be a very subtle phenomenon that may require a great deal of precision tuning. It will certainly require mindfulness. Yes, that is a good way of putting it. For me, the idea of individuality is very late on the chain of manifestation. It is the latest thing for me as I look back and unravel both my memory and my day to day life. Before individuality, there was a greater sense of community. And before that a greater sense of connection to Nature. In fact, the concept of individuality might possibly be only thousands of years old. There is more sense of individuality in the Western countries compared to the Eastern countries. I already know that you hold that opinion; however, for me that is simple bias resulting in a myth that strays from the discussion policy. Your reasons are yours alone and unless you think there is something productive there to help resolve inconsistencies, I don’t think we should go down that road. My opinion comes from the study of the historical scriptures produced from the two regions. Today, it is probably the same all over. My opinion comes from looking at the current conditions of peoples the planet over. Nevertheless, it will not take us in a productive direction as it is distractingly polarizing as you can already see. Vin: Today, it is probably the same all over. Chris: Ok, yes. I see what you mean and agree. Ego amongst humans doesn’t seem to be segregated by color, race, sexual orientation, nationality, nor religion. There is no denying that there are two very different fundamental premise that give rise to the eastern and western ways of thinking. Both may have their good and bad points, but to me good and bad are opinions and they are not relevant to mindfulness. You just see what is there without opining about it. My premise is of the Eastern variety and so is my thinking. Scientology premise is of the western variety and foreign to my thinking. The difference is very stark when one looks at how God is defined in the two philosophies. Since the difference in the two ways of thinking is so different that it would be polarizing for anybody who is not being mindful. I see no particular reason to believe stories about the individual encapsulated considerations transferring out of a body, floating free, and then coming to rest once again within a new body. To my way of thinking, this is unnecessarily complicated within the context of an already complicated universe. The universe may operate by simple rules but the resultant configurations seem to be made complicated by enormous volume. Considerations are abstractions that are patterns underlying concrete manifestations. There are concrete particles floating free and embedded in them maybe are considerations in some programmed form. There might exist free will but I do not believe it is found at the macro level of existence. Free will in the world at large would have to exist within that set of collapsed wave function. I do not believe that there is free will in that set of existence of which humanity is a part. If free will exists it would necessarily exist in the probabilistic state or possibly a state of existence not yet illuminated to us. “Free will” as it is normally laid out, like “life after death,” seems to be mental maundering which is not only imaginary in substance but is an abstraction rooted in deeper false assumptions such as “I am an immortal spirit.” For the sake of the OP, this is just me falling off the fence onto one side. Tomorrow I may recant, but really, I don’t believe in that fence neither do I believe in pure determinism nor in free will. I believe there are better answers waiting down the road once we ask better questions. I like the QM direction but am being careful not to mock up yet another ideological structure to lean on. I am about 10 minutes into this movie and I am liking it. I hope it is useful. It has reduced mystery and helped me level many inconsistencies in politics and religion. As conjectures go, that one is pretty consistent. It is easy for me to make a lot of sense of that. Chris: And yet, the elements have their beginnings in stars, so I wonder where elemental soul-dust has its beginning? Remember, spiritual and physical are different aspects of the same thing! So we continue our search of space-time to learn more about it without bias. “Looking without bias.” It is like we are needing the tool of a superior consciousness to look for what we are trying to know. That is a lot of corners of the sheet to keep track of when trying to make the bed. Superior consciousness comes about as inconsistencies are addressed one by one. Here superior is relative to one’s earlier consciousness. “Rebirth” as pronounced by religion is for sure an unverified myth at best and false at worst. And yet, physically “rebirth” is an allegory for every moment. There seems to be a discreteness which can be arrived at physically, which short of duration though it may be, can be said to be “reborn” every moment. This is a stretch as the definition of rebirth goes, but an allegory nevertheless. So is rebirth the truth or a myth? It is neither and it is both and it is more. (1) There is death Conditioned by what dies? (2) There is birth Conditioned by what is born or what comes to life? (3) There is recycling of physical dust yes. (4) There is recycling of soul dustconditioned on the assumption of soul and conditioned upon the assumption that soul is composed of discrete parts. I have never thought of soul in terms of its discrete parts before. We should discuss this some more. If the truth is conditioned, relative and impermanent, then so are all of these concepts.